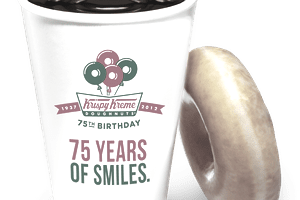 I interviewed Dwayne Chambers while he was the Chief Marketing Officer at Krispy Kreme, looking to learn more about the company's digital social strategies, and local and mobile apps (SoLoMo). Dwayne said "The brand was built on word of mouth (WOM) and we have not been a big spender on traditional media. Today digital is the WOM for many generations, and this is how people naturally talk about us. Everything they do with digital has to answer the question 'how do we engage with our consumers as a brand." Really caring, those are the customers that become brand evangelists, and that equates to passionate customers. Dwayne doesn't agree that anything worthwhile can always be measured and suggests that the biggest challenge is measuring "passion." Dwayne had a great analogy "Tell me how your wife loves you? Ultimately, in the end, there is some level of the qualitative in this. Social WOM for us goes beyond just measuring the number of occurrences of 'KrispyKremeLove' on Twitter." Dwayne had a great way to measure passion, noting that when many customers pick up a box of Krispy Kreme at the drive-thru, they dive into the box and grab one for themselves. How Do You Get to the Why? Dwayne is always interested in the 'Why'… the Why is what we call motivation in consumer behavior. So how do you get to the 'Why' at Krispy Kreme? "There are some analytic approaches. If you do a survey and ask consumers about their ideal Krispy Kreme experience, they will talk about attributes such as price, cleanliness, etc. However, if you delve deeper as what benefit do you get from this, you might hear that this is a place I can bring my family." Benefits of Bringing the Family? We might get the real reason: "Because I feel like a better Dad." This is where it gets interesting since most consumers don't think about the emotional aspects of why they do what they do. Well not just to meet these influencers…we wanted to be transparent." I noticed with a quick Google search that many of these influencers were Mommy Bloggers who are a new force in social media word of mouth and these bloggers have large followings because they are transparent. "These bloggers visited our Ivy Avenue plant where we make most of our mixes. We introduced them to the production people, our food scientists, people who worked for the company for 40 years plus and finally to our chef that introduced to doughnut pairings beverages that match our different flavors" according to Dwayne. "We thought about this; the biggest power is not to get people to use the brand differently but to make it easier for our customers to use the brand in a way that is natural. It is how the Hot Light app was born". Once a hot light comes, the app's push technology within seconds lets you know where the closest Krispy Kreme is serving hot Original Glazed® doughnuts. It helps to reinforce what people really love, which is getting the hot doughnuts. Here is my take on what you can learn from Krispy Kreme and apply this to a smaller food business. Don't over-think what you want to do with social media, the simpler, the better. Mobile offers are the perfect example. Or take this example from Dwayne: One Facebook posting simply showing a picture of a doughnut garnered over 32,000 likes Now that is simple. The sentiment is what they are looking for… and you should be as well. If you just look at how often people post or only what they are saying, you are getting only part of the equation. Make an effort to get to know the why. Make an effort to understand the true motivating factors that drive your brand. That is what Krispy Kreme does. Chief Marketing Officers (CMO) for years have thought they can own and control the brand which is no longer valid. Social word of mouth is your brand being involved, being in the blogosphere and just letting the brand live on. Be socially authentic, take Dwayne's advice and make all of your social media decisions based on how well they fit with your mission statement. Practice content marketing. It won't be at the same level as the Krispy Kreme Blogger Summit, but you can just imagine how all of the content virally spread to millions of readers.